Audi 4000 replaced the Fox for the 1980 model year. It was slightly larger than the car it replaced. The wheelbase was 99.5 inches, versus 97.2 on the Fox. Curb weight was about 2200 lbs. versus about 2100 on the Fox. Unlike the Fox, just two body styles were offered at first which were a 2-door coupe and 4-door sedan. Powering it the first year was a 1.6L SOHC EFI I4. It produced 78hp and 84tq. California cars got a 1.6L SOHC EFI I4 tuned for CA-emissions. This one made 76hp and 83tq. One transmission was offered with these engines, which was a 5-speed manual. Added late in the model year, the optional engine was a 2.1L SOHC EFI I5. It made 100hp and 110tq. The sole transmission with this one was a 3-speed automatic. This upgraded combination was quite expensive for the time at $1500. In 1981, the 1.6L engine was dropped and replaced with a 1.7L SOHC EFI I4. This new engine went down in power compared to the old engine and made 74hp but went up in torque to 90. Also new this year was a top trim called the 4000 5+5. This package netted the buyer cloth sports seating, adjustable driver seat height, cast alloy wheels, black window molding, tachometer and oil pressure gauge. It also came standard with the 2.1L I5/automatic combo. It was only offered as a 2-door coupe. 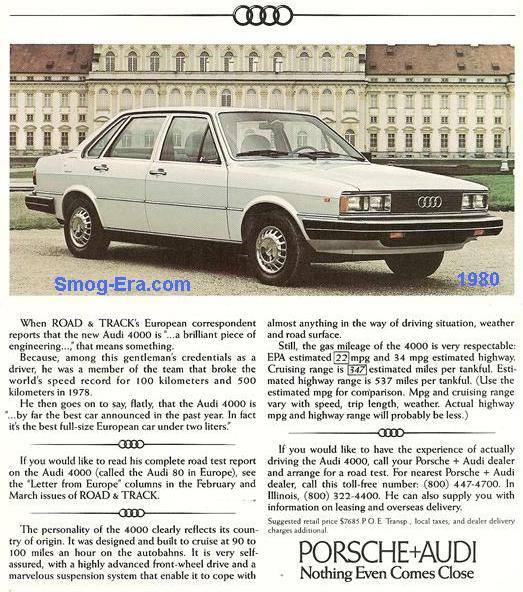 For 1982, the 5+5 package was dropped and replaced with the 4000S. The ‘S’ netted the buyer chrome trim, rear head restraints, trip odometer, vanity mirror, center console, and a sport-style steering wheel. Unlike the 5+5 it replaced, this one was offered only as a 4-door sedan. Also added in 1982 was an optional 1.6L SOHC Diesel I4. It made 52hp and 72tq. However in 1983, a 1.6L SOHC TurboDiesel I4 was also made available. It made 68hp and 98tq. The Audi 4000 nameplate carried on until 1987.